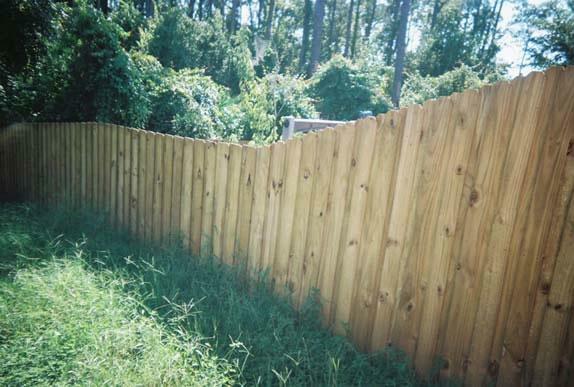 Wood fencing remains a popular choice among homeowners for its beauty, privacy, and longevity. Wood is also a versatile material that can be used for a variety of fence applications. The experts at McConnie Fence install high-quality wood fences using pressure-treated pine and providing top-notch design and installation to ensure that your wood fence will serve its purpose for years to come. To request your free on-site design consultation and no-cost quote, call us at 1-844-805-0847. You can also click below to fill out our simple contact form and one of our specialists will call you as soon as possible to set up your appointment. Board on board fences consist of central wood posts with wood panels on either side. The main benefit of this fence style is that it provides a large amount of privacy while also looking identical from both sides of the fence. Shadowbox fences are another popular option for privacy fences. Unlike board on board fences the pickets alternate between one side of the fence and the other. This alternating method leaves gaps between the boards which makes this style of fence slightly less private than other options. However, this fence design also stands up better to strong winds. No matter what type of fence you're looking for, we offer a wide range of styles and materials, including pressure-treated pine fences. Whether you are looking to install a wood fence around the perimeter of your yard, garden, or anywhere else, you can trust McConnie Fence to provide high-quality products and professional, hassle-free installation. Call today to request your free estimate for wood fence installation! We are your expert fence company in Lutz, Brandon, Tampa, Valrico, Wesley Chapel, Seffner, San Antonio, Plant City, Holiday, Haines City and surrounding towns and cities.